Railpictures.ca - Marcus W Stevens Photo: CN local 551 is seen heading back towards Aldershot as it departs Milton with three cars in tow after meeting train 422 with a couple of dimensional loads. The centre beam will be left at Tamarack Lumber in Burlington on its way back. 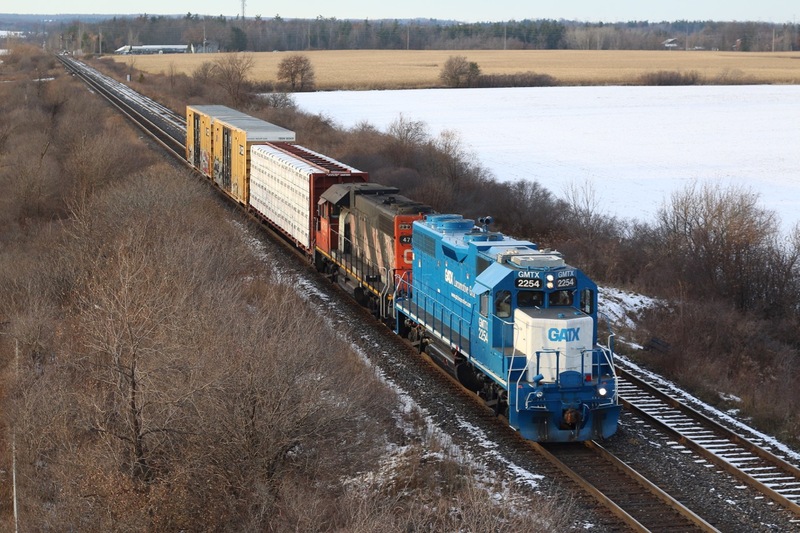 Lead unit GMTX GP38 2254 is wearing similar colours to those it wore while working for the GTW so many years ago as GTW 5810, and is seen once again working for its old parent company Canadian National. | Railpictures.ca – Canadian Railway Photography – photographie ferroviaire Canadienne. Caption: CN local 551 is seen heading back towards Aldershot as it departs Milton with three cars in tow after meeting train 422 with a couple of dimensional loads. The centre beam will be left at Tamarack Lumber in Burlington on its way back. Lead unit GMTX GP38 2254 is wearing similar colours to those it wore while working for the GTW so many years ago as GTW 5810, and is seen once again working for its old parent company Canadian National. Nice Marcus! Now I don’t need to travel to the Dundas/Halton to see these units. There’s no shortage of them on the CN Guelph Sub!